Today Entelo is proud to deliver the 2018 Recruiting Trends Report which summarizes and highlights the strategies, pain points and motivations driving candidate sourcing, engagement and outreach for modern talent teams. Last year, we released our inaugural report which uncovered preliminary hiring trends taking us into 2017. This year, the survey expands to also examine how companies and talent acquisition leaders allocate budgets and prioritize resources around key concerns such as employer branding, diversity efforts and the growing importance of machine learning and artificial intelligence. 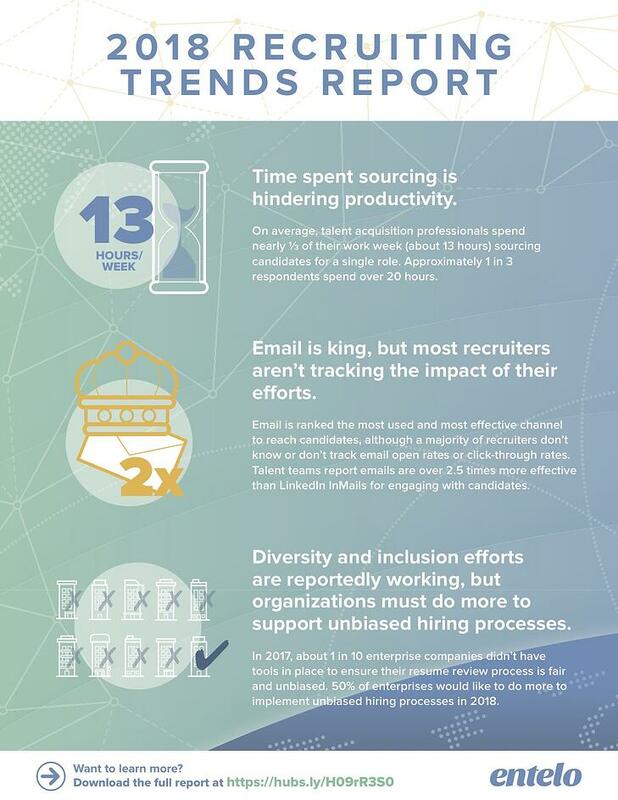 After surveying 1,143 talent acquisition professionals from around the world, Entelo is here with key findings that will help recruiters stay ahead of the hiring trends and arm their teams with the right tools to win the war for talent in the year to come. Sourcing quality candidates is a top priority, but a major time sink for talent teams. On average, talent acquisition professionals spend nearly one-third of their work week (about 13 hours) sourcing candidates for a single role, and some groups spend even more. Approximately 1 in 4 (27%) respondents report spending half the work week (20 hours or more) sourcing for just one role. Most (70%) agree that recruiting automation would increase productivity. To make sure your teams aren’t getting bogged down in the weeds, consider evaluating recruiting automation tools that help you streamline tasks like candidate sourcing. Interestingly, the second most valuable aspect, sourcing, can be automated with tools like Entelo Envoy, so that recruiters can spend more time on the human elements of recruiting like building rapport and communicating quickly. As you evaluate tools to automate elements of the hiring process, make sure you’re considering where your team shines. Look for tools that will augment your team’s abilities and not removing elements that are key to building strong rapport. Budgets are shifting toward AI-powered technologies. Next year, 62% of companies plan to spend on AI-powered recruiting software. Of those, 86% plan to spend on intelligent sourcing software, compared to only 30% who plan to spend on HR Tech chatbots and 26% who will spend on digitized interviews. Are your competitors getting ahead of you? Now is the time to take a hard look at your budget allocations and make sure you’re evaluating new solutions on the market. Spending on traditional tools is plummeting. Say goodbye to newspaper ads. Approximately 7 in 10 respondents plan to spend less or none at all on traditional advertising like newspapers and print. When examining your recruiting budget, make sure you’re not allocating resources to antiquated platforms. Email is king of candidate engagement. More than half of respondents confirmed email is their preferred method of outreach and 39 percent find email the most effective channel. This is in sharp contrast with views of LinkedIn InMail. While 30 percent of respondents report using InMail, only 15 percent find it an effective way to engage with candidates. As hiring gets more competitive and talent teams are strapped for resources, ditch the tools that aren’t working and make sure your teams have top of the market tools to source candidates and acquire their email addresses. Recruiters need to think like marketers. A majority of recruiters don’t know or don’t track email open rates or click-through rates, of those who do, more than 1 in 3 (37%) do so manually. According to Marketing Profs, The State of Email Marketing by Industry, 2016, 85% of marketers regularly monitor email open and click-through rates, and it’s considered a standard best practice. To get ahead, partner with your marketing teams to make sure your candidate acquisition is as sophisticated as your customer acquisition. Employees make the best recruiters. When asked about important sources of hire, 54% of respondents rank third party sources (Agency, consulting firm, talent marketplace, etc.) as least important and 78% agree employee referrals are most important. Ensure you’re not wasting money on sources that aren’t delivering and instead use your resources to empower your internal team of brand ambassadors, your own employees. Sourcing is still biased. More than half (53%) have tools in place to ensure the sourcing process is fair and unbiased, though 49% of that group agrees they could be doing more to ensure the hiring process is without bias. Could you? Fortunately, there are tweaks you can make to your existing processes. For example, using Entelo, you can anonymize your candidate search results to reduce unconscious bias. Diversity and inclusion efforts are working… according to employers. Promisingly, 65% of respondents reported having a diversity initiative in place and of those, 89% report these initiatives are successful. We know this doesn’t mean D&I problems are solved, it’s a promising stat that supports the notion that at least companies that put energy toward this are seeing early signs of success. Asking yourself what your team is doing to move diversity efforts forward is a good first step. Organizations must do more to support unbiased hiring processes. In 2017, about 1 in 10 enterprise companies didn’t have tools in place to ensure their resume review process is fair and unbiased. If you’re like the 50% of enterprises that would like to do more to implement unbiased hiring processes in 2018, the time is now to take action. Not only is it the right thing to do, but adopting best practices now will make sure you’re not behind the curve when it comes to diversity hiring. Progressive organizations recognize talent teams as strategic business partners that can be key drivers of growth. But many still struggle to get the resources they need to achieve their hiring goals. Organizations who can better understand the talent industry’s shifting trends can prepare for what lies ahead for the world of work. Read Entelo’s 2018 Recruiting Trends Report.